Instant Quotes on Reliable International Courier Services. The Easiest Small Business Solution. We have all of the international courier services available for instant quotes and fast online bookings. For businesses with more complex needs, our network of global carriers is complemented by FreightDesk, our freight management software that makes shipping easy. We integrate with major international couriers for seamless worldwide shipping. Bring your own international couriers onto FreightExchange and manage all your freight in one place. If your couriers aren't competitive, simply book one of our reputable couriers instead. You can use our eCommerce add-ons to ensure that your international shipping quotes are provided to your customers accurately. You can use our APIs and plugins to 1) quote for shipping 2) instantly create labels 3) track packages from dispatch to delivery. We offer competitive air freight rates for shippers sending oversized cargo starting as small as 1m3. With dozens of couriers, freight brokers and air cargo specialists on the system, we simplify the booking, quoting and monitoring processes and remove manual processes. International shippers save time and money. 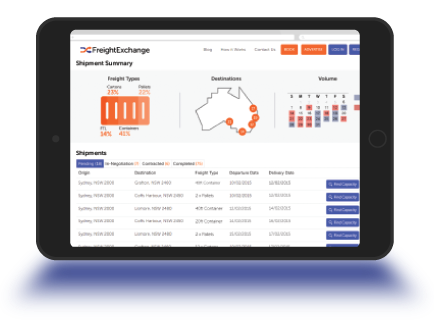 The online FreightDesk platform provides businesses and their customers with up to the minute information on deliveries and manual steps and simplifies the booking, quoting and monitoring processes. Our eCommerce integrations help businesses automate customer deliveries Worldwide.